I think the main problem of KM is that it’s evolved, changed, and innovated what it has to be in the organization – but few of the original practitioners have changed with it. In refusing to change (or not realizing that the change happened) they’ve fallen victim to the same trap that so many now defunct companies have in ignoring the direction the market went – choosing instead to concentrate on being the best in a market that no one really cares for anymore. They have, in effect, been disrupted. I admit that may be a bit of a harsh statement – but KM always suffered from 1) having too wide of a remit and a defining umbrella and 2) Not being focused on driving realizable value into the businesses that implemented them. It was the first iteration onto what’s since become the collaborative and social movements – that have effectively built on the fundamentals that KM pioneered – and added to that the concepts of scale and focus. The value of KM in the early days was, as you rightly pointed out above, the identification of knowledge as a valuable “thing” – one that companies could capture, manipulate and maximize much like other resources. But at some point KM stopped being about the knowledge “thing” and started being more about the knowledge “process” – and now even more about the enablement of flow. In my mind, knowledge and collaboration aren’t two sides of the same coin – they ARE the same coin – but with different dates. The need for old-school KM in the enterprise is now very limited – just like the need for pure mathematics is – it’s the application of those fundamentals towards driving new sources of value in the enterprise that holds real interest in the business world – and, in my mind, Innovation is the instantiation of that evolution. In that same vein though, I would put it to you that looking at the exchange of insights isn’t quite the right way to think about this either. Insights are very much in the old knowledge “thing” way of looking at this I think. Instead – I’d think about the knowledge “process” of stimulation – and the stimulation that drives Innovation outcomes can come from multiple different “things” and multiple different methods of applying those “things”. It could be as simple as visual cues, or as immersive as topic focused lectures. It could be provided in an instant or delivered over days and weeks. It could be provided in person or electronically. Our job is now to find the right “thing” to stimulate the right person in the right way to achieve the right result for the organization – no? KM must redefine itself, working to regain relevance. Re: the “things” dilemma I introduce “flow of insights” as metaphor not to keep “things” in the mix, but to find a more accessible alternative to “knowledge” .. KM has enough challenges without being battered by semantics of abstract ideas ..
Re: org learning I see “flow of insights” is an intentional step in the direction of a fluid process, a dynamic (not static) frame for how organizations can learn. Think Wheatley, Argyris (double loop) ..
Re: technology there’s a social element lurking in our future, an enterprise flavor of Twitter and WordPress that, when integrated and ubiquitous, will be needed to give org collaborators a way to get people talking inside the firewall as freely as we do on the outside. Always a pleasure Boris .. keep those good ideas coming. KM can’t redefine itself. As Indian lore would suggest, it must die in order to become something better than what it was. That said, there are many organizations that never really ever embraced KM — they still just have content repositories. And there are many, many more that are just going through the motions. But it all fundamentally goes back to the fundamental design proposition: what problem were we trying to solve? The problem wasn’t to manage knowledge. The problem was to connect resources to answers. More often than not, the context of the question was not fixed, meaning the answers could not be fixed either and that the answers were only to be discovered through other people, not some content repository. The problem has ALWAYS been a social one. The solution was in denial. My one test of a stellar KM environment was simple and many failed right off: was the ‘core’ of the solution to feature/connect individuals to each other? Thanks for the input Paula. Enjoyed the Business Sutra episode: the cycle of knowledge as generational, the wise passing back to the youth. Definitely echoes Nonaka on “care” .. “intention” .. social responsibility .. In terms of KM missing the point, hindsight again proves to be 20-20. Much easier to frame the problem in the social context now. But in the pre-social media 1990’s could we even imagine social technology? What the internet would be capable of? I wonder if KM reflects the silo structures of its internal customers .. with hierarchy being the only model for org structure, communication channels and authority that was (and often, still is) embraced by business and IT alike? Actually, it may be best to train our creative energies on the path forward. 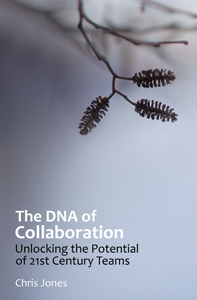 Can we incorporate design thinking in the future state of the collaborative enterprise .. the “connected organization”? Making me think, as always .. and always appreciated. Let me just echo support for all the lines of thinking here. Especially like Paula’s insight that it has always been about social. We just keep forgetting that, whenever a shiny new toy comes within sight. The “care” piece is interesting to me. John Hagel et al get at something like that in the Power of Pull. Gary Hamel talks about it (passion) similarly. Others do as well. The point is: There is something that makes connectedness worthwhile in term of generating insights….we need a language for that. Also like your use of “insight.” Resonates with some work I’ve seen that talks about “temporary convergence” – where in online communities you have divergent thinking temporarily (and in small pockets) converge. Downside is that it’s temoorary and fleeting. Upside is that it’s an insight, I suspect. And there’s lots of it. Thanks so much for the comments, Jeff. When ideas start to resonate, I know we’re making progress! Glad that “insight” resonates with you. To me, insight is the raw material of contextualized ideas, and their value is neglected .. perhaps due to their ephemeral nature or high volume ..
A place that encourages learning via the flow of insight, fostering the emergence of new ideas that lead to the development of deeper understanding, enhanced stakeholder value, and new knowledge-based capabilities .. Capability is another key word. To me, that’s the linkage back to business value. Knowledge itself isn’t actionable. Capabilities mean we can do something we couldn’t do before ..
Food for thought. Maybe we can we add to this, and make it better? Am in total agreement with you that “capability” is a key word linking to back to biz value. And what you’re writing here is key – connecting the dots between the importance of flow and what it ultimately does for an organization. Cheering you on from the sidelines on this one. Need more people articulating the solution language in ways that redefine KM (or whatever we call it!). Excellent feedback Jeff, couldn’t agree more re: logical sequence. And there’s no need to qualify “capabilities” .. any new/enhanced capability scores a win ..
Not sure this frame reflects enough re: care / purpose / intention ..